America's Go-to DIY Guy, Eric Stromer of HGTV's "Trading Spaces, "Over Your Head" & "Clean Sweep" Joins American Choice Awards TV Team as Home and Garden Category Expert. I'm working with The American Choice Awards to help DIYers & pros get their jobs done right. America's Go-to DIY Guy, Eric Stromer of HGTV's "Trading Spaces, "Over Your Head" & "Clean Sweep" Joins American Choice Awards TV Team as Home and Garden Expert. 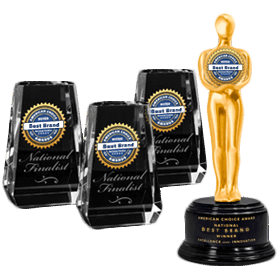 I'm working with The American Choice Awards and Best Brand Winners to help DIYers & pros get the job done right. The American Choice Awards brings together foremost research, influential media and consumers nationwide to determine America’s favorite brands. A great note from alumni: "Once American Choice Awards announced us as a National Best Brand Winner we began receiving inquiries from editors and journalists from magazines and TV. So far we’ve been featured in seven stories & gift guides. Healthy Living even invited me to write regular articles. The CBS News reporter did a wonderful story about our company and products. Then I was selected to speak at the Governor’s annual leadership event. Thank you to everyone at The American Choice Awards". The red carpet is rolled out and the podium is center-stage to spotlight winners of the National Best Brand Award. Dubbed “The Oscars of Innovation”, The American Choice Awards are the only national TV awards celebrating product excellence & innovation and the talented professionals who bring them to life. Winners star in Best Brand Winners Announcements on Morning Shows & Talk Shows, Best Brand Shopping Lists in magazines, editorials & press releases, satellite media tours, and retail promotions.